After almost ten years, we finally gave our daughter her graduation trip to Europe. First stop – Munich, Germany. I discovered that the treat of visiting familiar places is that you spend your time visiting and rediscovering favorites: a brat at the Hauptbaunhof, a stroll to the Marienplatz, and dinner at The Augustiner were just a few. A day trip to Berchtesgaden, the site of Hitler’s retreat, known as the Eagles’ Nest, proved to be a major disappointment. I usually plan my trips down to the last detail. This was a last minute decision to visit what I thought would be a piece of history. The view is outstanding but the building is a restaurant, with tours offered only in the morning. The place was packed with diners consuming the German equivalent of fast food. It was difficult to get a sense of the places’past. 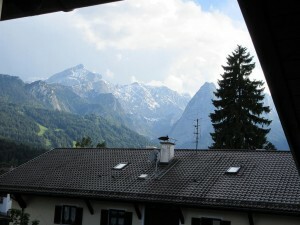 We ended this part of the trip with an overnight stay in Garmisch-Partenkirchen, a lovely mountain retreat. I chose a local hotel and wondered if it would be possible to find the little restaurant where I had enjoyed a plate of Bavarian “mac and cheese” four years ago. 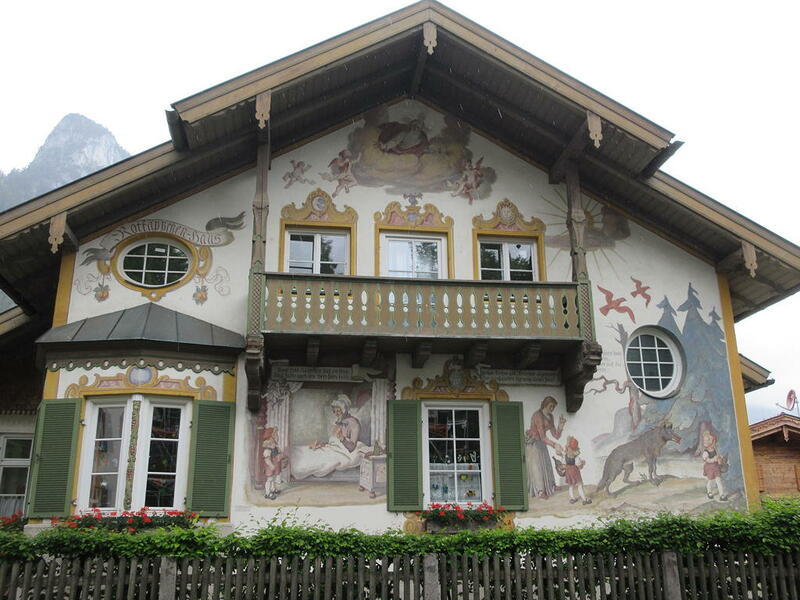 It was with great surprise that as we entered Gasthof Fraundorfer, I realized that that this was it, the exact place. What a surprise that with a multitude of choices, I had accidentally wondered back to this traditional German restaurant. The mac and cheese was still good. While I can appreciate all of the beauty of Germany, my heart belongs to Italy. 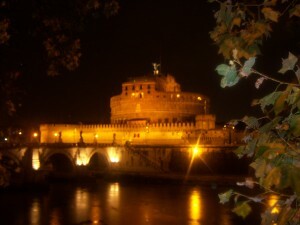 Its ancient buildings, pasta, and wine beckon me. 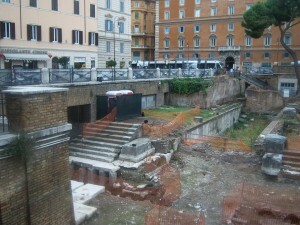 This time, I rented an apartment, wanting to experience a little of the Roman lifestyle. It did not disappoint. No working air conditioning, no dryer, a shabby exterior all combined to make it an authentic experience. I am not sure what happens when I visit this country but all of the comforts that I need in the US seem unnecessary here. We returned for a second time to one of my favorite places, the Torre Argentina Cat Sanctuary. This is an amazing place where volunteers accept several hundred displaced felines, vaccinate and neuter them, as well as provide any necessary medical care. Many of the pets are blind, sick, or hurt but they are all loved by the very caring staff. The cats are allowed to wander the ruins of four small temples. Visitors are welcome to pet, talk with the volunteers, and of course leave a donation for this very worthy cause. Wandering the narrow, cobblestone paths, eating gnocchi quatro formaggio, enjoying a cappuccino, licking a Bacio gelato; these are a few of my favorite things. I always throw a penny into the Trevi Fountain to ensure a return visit to Rome. Let’s hope its magic does not disappoint. I signed up for a two hour Nordic Walk using walking sticks. When the time came Mike and I were the only people wanting to walk and the trip was canceled. Disappointed we asked the front desk for other options and she pointed out a nice walk across a mountain. It was short distance from our condo so I eagerly set off. After about a mile or so we arrived at the Hundle ski lift. Up the mountain was easy (considering my fear of heights) and then we began the walk. Some of it was uphill but most was very pleasant with awe inspiring scenery. The region is known for its cheese so cows are everywhere and since they need to be rounded up they wear cow bells, This tinkling sound accompanies the walkers. As we ascended a man about seventy came upon us riding his bike – what fitness some of the people have (and muscular calves)! Soon after we started across the mountain path, it began to rain. The trees are so full in the area that they provided a nice shelter. The rain in the area quickly comes but also disappears as fast so we were able to continue on and encountered a small forest. We felt like Hansel and Gretel being careful to watch out for the witch. Our of nowhere appeared a small restaurant with a toilet. Wonderbar!!!! A lunch of pork roast, potatoes, Kaiserschmarr (cut up pieces of pancake served with applesauce) and a Ratler (beer and sprite) energized us to begin the descent. This proved to be somewhat more difficult than climbing up. Walking slowly we made our way down and took a bus back to Oberstaufen. The trek was a total of seven miles, a pretty far distance for these southern Americans. The next day we went on an expedition to a cheese factory. The area is known for its moutain kase (cheese). After a breakfast of cheese (of course), fresh bread and the best marmalade I have ever tasted (red current) we walked past the cows to the cheese factory. The tour was conducted in German and translated by our guide who spoke a little English so I really don’t know the facts but figured out that the local farmers bring their milk which is poured into a large vat and stirred. I am sure other things are added and then the cheese is placed into a press to rid it of all excess water. Interestingly this collected and sold to be used as beauty and bath ingredients. The large round bundles are then dipped into a salt bath and turned on a frequent basis. After that they are transferred to a cold room to mature. Every two days the cheese is flipped to the other side. The more it ages the better. We were able to eat as much as we liked but since cheese was the main course for breakfast I was not as enthused as I should have been. For a mere 48 Euros we decided to take a day bus trip to Switzerland. Beginning at 9:50, Mike and I climbed aboard a air conditioned (rare in this area), comfortable bus with a tour guide in traditional Bavarian dress (lederhosen on a somewhat stocky man – not exactly Brad Pitt.) The route took us to Lindau on Lake Constance the largest lake in Germany down to Austria and west to Switzerland. We stopped in Zurich, which is a large banking city. The Swiss did not join the Euro system and operate with Swiss Francs which is annoying. They also have one of the most expensive economies so my shopping adventure turned out to be mostly window viewing. I did find a nice pair of hiking shoes and some books as well as one of the most chocolate pastries eaten on this trip yet but after two hours I was more than ready to get back on the bus. Zurich may be appreciated better by the rich and famous. Next stop the Lindt chocolate factory outlet. We were able to purchase as much as we could hold which for us meant as much as our suitcases could hold. It was fun picking up flavors that I have never seen in the U.S..
After re-boarding the bus, we went around some awe inspiring mountain vistas with lakes, trees and meadows. I tried to quickly capture it all through the bus window and was somewhat unsuccesful. 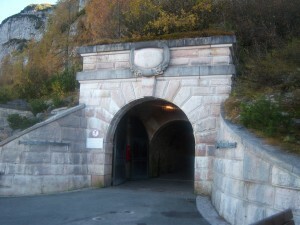 The group passed on through the principality of Lichtenstein another very wealthy area. It is always enjoyable to see and learn new things but I appreciate the tiny quaintness of Oberstaufen to the grandness of Switzerland. We ended the evening at a local rathaus where no one spoke English. I pulled out my iPhone and used the translator app. After a painstaking time of trying to interpret the menu, I chose rump steak (not really sure what I would get). The waiter stopped by several times and Mike attempted to get him to understand what I was doing. He looked at my choice and shook his head appearing to say that they were out of it. The whole restaurant broke into laughter – apparently a stray pair of Americans is worth observing. Oh well, I quickly ordered schnitzel and fries and moved on. Perhaps another night I will find out what rump steak is. 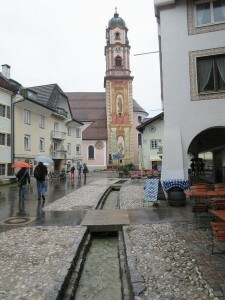 Our destination for the second week of this European vacation was Oberstaufen, Germany. This is a small town in the southwest part of Bavaria. Nestled in the mountains is a tourist destination for the local people. We stayed at Mondi-Holiday, a resort with chalet type apartments. While tiny, they had all of the things we needed to be quite comfortable. The English speaking staff showed us the short cut into town and since our stomachs’ were grumbling we immediately set off. The short cut was all uphill and I was plenty grateful for the hours spent on a treadmill and at the track this past year. Atop of the climb was a small town filled with a beautiful church and many nice places to eat. My favorite so far has been Spatzle mit Kase (a Bavarian macaroni with cheese). We went to Mass on Sunday to a totally German service but since the Catholic service is universal I had no problem joining in. I even sang to one song since I knew the melody. The service was accompanied by a choir with organ, violins and timpani so it was quite lovely. The congregation was predominately older people and we were told later that the younger folk hold Christian values but do not care for a church that does not seem to fit in the 21st century. This weekend Oberstaufen held a street market or neighborhood festival. Kiosks of food surround tables and a musical stage. We ate sausages, roasted chicken, french fries (which are huge in Europe) , roasted almonds and different kinds of cakes. I drank Apfelschorle (apple juice with fizzy water) while Mike sampled the local beers. The music was Bavarian what we might call oomph music. It made you want to swing back and forth which much of the crowd did joining in on refrains. The night ended with a five piece Alpine Horn band (think Ricolla cough drops) which was peaceful and seemed to be the same song over and over. I enjoyed mostly watching the locals enjoy a favorite past time. 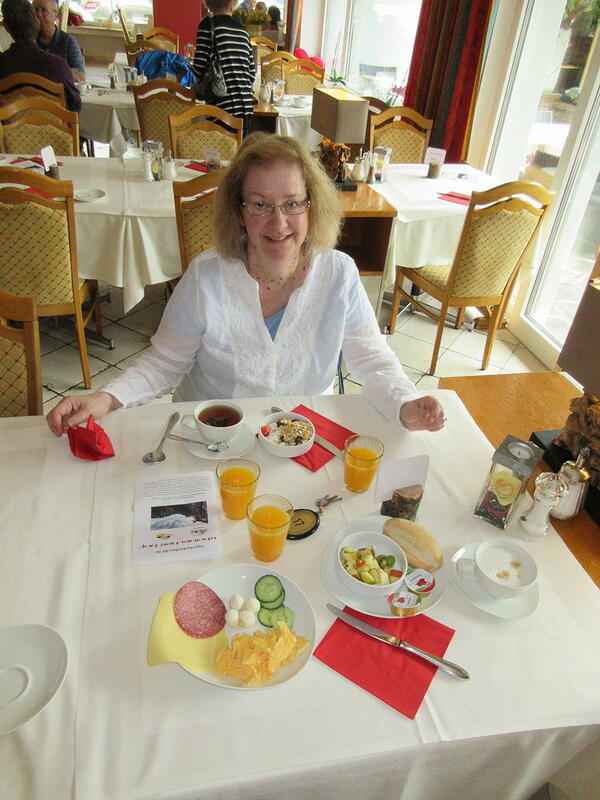 We stayed one night in the Frankfurt, Germany the city of banking and Apfel Wein (apple wine.) Our German friend Uschi took us around the old part of the city explaining that unfortunately most of the older buildings had been bombed in World War II. The Germans rebuilt this small area of the city that includes the town hall. 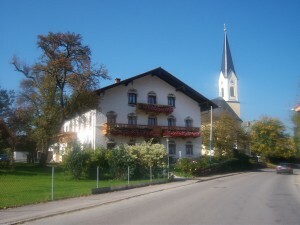 Uschi explained that she had married her first husband in that building. Michael Jackson died the day before as well as a young woman in Iran. The area was filled with people mourning their deaths through displays of pictures and candles as well as musical tributes. It was fascinating to see German teens dressed as Michael singing his most famous songs. Of course Mike joined in for a bit of the sing-a-long. We ate dinner at Uschi’s favorite restaurant, a small place on the outskirts of downtown Frankfurt. Her friends Ziggie and Herbert awaited us with a traditional pitcher of Apple Wine. It is low in alcohol and very dry. The Germans usually mix it with fizzy mineral water or orange juice. I chose the mineral water and found it very refreshing. Germans love to eat outside (regardless of how pretty the indoors might be) perhaps because they don’t get many opportunities to do this so we sat at a long picnic type table under umbrellas in a fenced in former parking lot. It is also a custom in most European countries to value the hundes (dogs) so many canines shared our dinner atmosphere, usually politely parked under the table of their owners. I ordered the Frankfurt Schnitzel, a wonderfully crisp piece of pork and fried potatoes that came with a indescribable but delicious creamy green sauce. Dessert was fresh strawberries over Bavarian cream. It took several hours to finish the pitcher of wine but the good conversation (in German and English) made the time go fast. Another characteristic of European dinners is the length. Server only come when you need them and allow you to have a relaxed dining experience. You have to ask for the tab. We have been told that they get paid well and tips are extra not expected. Perhaps that is why. First and foremost I am glad that I got to spend a day in one of “the most beautiful cities in the world.) That being said, it is a dirty city filled with bicycles, motorcycles, trams and cars. These forms of transportation will go down any street as long as they fit. Pedestrians seem to have no right of way so you take your life into your hands in a seemingly quiet walk way. A city of canals, they are brown and decorated with houseboats that may or may not have curb appeal. The most important thing on my agenda was seeing the Anne Frank Huis. An important help tip – buy your tickets in advance on the Internet. The lines are long and in the sun. With tickets in hand we bypassed the queue and walked right in. There are many things to see, hear and read but the highlight is standing in Anne’s room imagining her writing and dreaming of a better world. Knowing that her dream was not realized makes you ponder destiny and your place in this world. Did she accomplish much more for dying??? They have the actual diary under glass – how awesome. The book shop was a teacher’s delight! I bought so many that the cashier asked if I was an educator. They had books that I would never had been able to get in the US or Amazon. We then went to the Rijks Museum – the home to many Dutch Art Masters. I stood in front of and learned about Rembrandt’s “Night Watchman” and “The Jewish Wife” but the highlight for me was the three Vermeers. After watching “Girl With a Pearl Earring” I developed an appreciation for the camera aspects that Vermeer applies to his work. The day was concluded with a requisite canal tour that provided a different perspective of the houses and an hour to relax your feet. I was glad that we were able to return to Drenthe, a quiet province to the northeast. Amsterdam was too busy (it even gave Mike a headache) that the peacefulness gave us a great night’s sleep. In spite of all of the touristy things, the highlight of my day was noticing a real hedge hog creeping about outside our window. I have never see one especially in the wild. 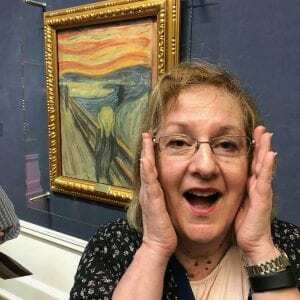 It looked exactly like a Jan Brett illustration. I was thrilled. This area’s love of animals – geese, ducks, cows, sheep, goats, cats, ponies and dogs can be seen almost everywhere helps to keep me from missing my own too much. Arrived in this rural northwest area of the Netherlands late afternoon on Friday, June 19, 2009. We are staying in a Bungalow Park which is kinda like fancy camping. The two bedroom unit is sparse which is normal in Europe with the basic essentials and nothing more. At first I wanted to bolt for the nearest four star hotel but knew that that was not going to happen so I decided to make the best of it. After purchasing an extra pillow, towel, chocolate and pastries, I have decided that the unit will do for the week. 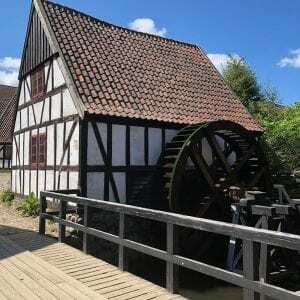 Landal Greenpark is in walking distance of a windmill and quaint thatched roofed farm houses. The people all speak “a little English” and are very friendly. The Dutch LOVE their dogs so the four legged critters can be found everywhere – restaurants, shopping centers, etc. We have mostly just driven around (a car is necessary to really enjoy the region) and stopped when something looked interesting. This included the megaliths (prehistoric burial tombs), pannenkoek shops (pancake houses), Boomkroonpad (a walk across the top of a forest) and Westerbork (the transit camp Anne Frank was sent to before Auschwitz). The Dutch put any possible combination of fruit, vegetable and meats in their pancakes so you can eat these high calorie yummies everyday (and I have). They also have a bakery in every hamlet that is filled with many delicious breads and pasteries. The Netherlands is flat which makes it a great place to run so I have continued my half-marathon training. The weather has been cool so the minutes tick off much faster than they have in Clarksville. 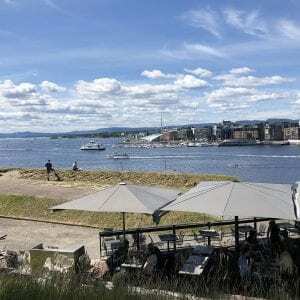 This is not a popular tourist place but that has been a definite advantage – there are plenty of things to see, do and eat but no throngs of people.